When you've been playing together for four years, the camaraderie is built in. Knowing where your players are going to be for the pass, understanding shooting tendencies, and knowing that your team has your back defensively are all skills that come with a history of games played together. When you've playing together for nearly your entire life, all of that is amplified. That's the case for the Wilsonville boys basketball teams' seniors. Jack Roche, Grant Irby, Sam Westing, and Zach Rivers have all been playing together, in some iteration or another, for more than a decade now. Not only have they grown as teammates, they've understandably grown as friends as well. "We, as seniors, are really close," Rivers said. "We got to lunch a lot, every Friday we go to lunch. Me, Sam, Grant and Jack have known each other since about the third grade. We always played together from a young age, and that connection has kept us bonded on the court. The communication we have on the court is good." Last year, the four of them were joined by Nolan Thebiay, who moved with his family from Bend so his father could be closer to work. While the team history might not have been there for the athletic post, he felt welcomed by his new teammates, and established himself as a leader on the court this season. "It was definitely a difficult move going that far," Thebiay said. "I knew one kid coming here from baseball. Aside from that, it was difficult. Some of the guys on the team I met first when I started coming here (were) Jack, (junior) Andrew Classen, (junior) Dakota Reber, and those guys branched me out to the seniors last year. They really took me under their wing. I'm very thankful for it. It was amazing how quick it was, but I'm thankful for all of these guys." 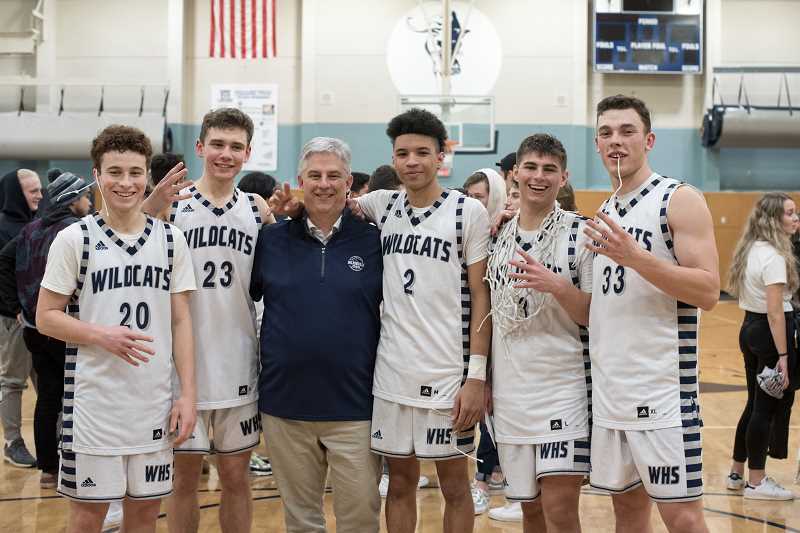 The time that the seniors spent on the court in the blue and silver has been some of Wilsonville basketball's finest. Over the course of their high school basketball careers, Wilsonville has made it to the state championship game, and captured three state titles. That can be a lot of pressure to live up to, but to hear them say it, it actually wasn't. "We just try to take it game by game, do the best we can, and get better in practices each and every day," Grant Irby said. "There's not that much pressure." "I think we place expectations on ourselves, but outside pressure doesn't dictate it," Roche said. "We're who we are, and we want to get better every day. I think we have pressure on ourselves, but I don't think it bothers us." This past season saw Wilsonville run up a 27-2 record and capture the state title in the process. The team also defeated every Oregon-based school they played, as well as some intranational teams as well. Part of the reason has been the talent and raw athleticism of the team, and part of that was due to the experienced cadre of coaches. "The coaching staff is amazing," Irby said. "Coach Roche leads us and helps us get better each and every day, and we focus on team basketball and moving the ball around. Everyone gets touches, and we're trying to get the best shot we can. I think that separates us because not a lot of teams are as selfless as we are." That team ball led to plenty of exciting opportunities over the seasons. Whether it was contending state championships, or traveling across the country to play in Massachusetts, or traveling across the ocean to play in Hawaii, different things came to mind for different players. For Westing, the memory that sticks out to him was being there when the team won its second boys basketball championship. "Sophomore year was the first year I swung, (so) I got to make the trip out to Gill for state when we won," Westing said. "That was an experience. Even though I was a sophomore and I didn't play a lot, just being a part of those guys, Zach Reichle, Harrison Steiger, Zac Woodworth, Kyle Willett, all of them, and being around them and learning from them ... being a part of that championship team was something I'll never forget." And now, with three championship wins in five appearances in the state title game, this senior group passes along the torch to a new group of leaders. If past is prologue, those players need to follow the example of these seniors, just as this group is to the seniors before them. "The biggest thing is, we can always get better," Rivers said, "despite any success we had, we can always get better and keep winning games. That's pretty fun." "We have to take it one game at a time, achieve our game goals every single game," Thebiay said. "We have to rebound every game. Some games it could be different, but we have to give our best effort, come out strong with good energy, and be willing to be unselfish." Wilsonville head coach Chris Roche will miss this group of seniors when they're gone as well. They each brought something special to the team, be that a well-rounded athleticism honed in different sports, or a personality that inspired the team. "Nolan is an impressive young man," Coach Roche said. "He's one of the hardest-working kids we have ever had, and at the same time, he's a big, strong, great athlete. His approach and likability make him a natural leader. He's a fun kid, and a key guy for us because he's a really good all-around post player, somebody who can help with rebounding, toughness and scoring, too." "The thing about Grant is that he's a great athlete, and a tremendous young man," Roche said. "If you know him, it's no surprise he scored a couple touchdowns in the state championship football game. That was no fluke. He's tough and smart, and he loves basketball, too. Grant can shoot, handle the ball, and defend. He's leading us by working hard every day in practice, and he's always ready to go when we call his number in a game, too." "Sam is an awesome kid," Roche said. "He has a gentle disposition that's endearing, but at the same time you would be mistaken if you took that to mean he's not tough. He's competitive, strong and a really good athlete. His basketball season was set back some early by an injury and long recovery period, and then our gradual return to play philosophy at WHS, which is important. But he's a player. He can do all sorts of things well, and he did them more and more." quick and athletic and tough. He's hungry, and he's playing very hard just about all the time." all the assists he has, he produces points for us at huge rates."